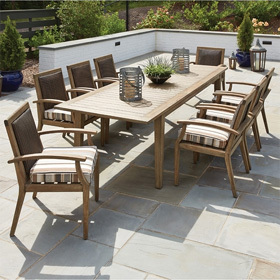 Featuring a mix of stationary and motion-based seating options, this complete patio arrangement from Woodard will bring long-lasting comfort and refinement to your patio space. The loveseat and chairs are notable for their durable wrought iron construction, fluid frame designs and full cushioning; the seating is paired with outdoor accessory tables that offer the ideal amount of surface space for a large-scale set. Loveseat 82.5"W x 42"D x 38"H 123 lbs. Lounge Chair 40"W x 41"D x 45"H 78 lbs. Ottoman 31"W x 23.3"D x 18.5"H 24 lbs. Chat Table 36"Rd. x 21.1"H 56 lbs. End Table 22"Rd. x 20.8"H 19 lbs.